How Do Car Alignments Work? The car alignment is an important part of keeping your car safe and running well on the road. Your suspension relies on your axles and wheels being appropriately aligned. Otherwise, it could pull to a certain direction and cause difficulty driving. The process to aligning your vehicle is performed by a mechanic and involves precise measurements and angles that are provided by your vehicle's manufacturer. These suspension angles are referred to as camber, caster, toe, and thrust. When your car is aligned, the axles and wheels are positioned so that they are moving in the same direction. If you notice that your car's steering is vibrating or pulling in a certain direction, it's likely that you need an alignment. The type of alignment will also depend on the type of drive train. 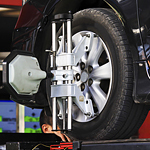 For example, if you have a front wheel drive car, then you will get a front end alignment. Stop by Spradley Kia to get a great rate on a car alignment.